Peak Structural will inspect and fill your concrete cracks and joints. If you’re worried about the longevity of your concrete, you may want to think about sealing the joints and cracks that make up your driveway, sidewalk, or other concrete feature. The concrete specialists at Peak Structural can install a professional, long-lasting sealant to help preserve the integrity of your concrete. This innovative sealant is called Nexus Pro. Nexus Pro is a silicone-based sealant that prevents water ice and dirt from infiltrating the concrete joint and the ground below. It can also work in the reverse by preventing things from below your concrete from rising up, such as radon gas. Finally, our Nexus Pro solution can help improve the look and finish of your concrete slab. If you’re interested in Nexus Pro by Peak Structural, give us a call and schedule a free estimate today in Colorado Springs, Denver and surrounding areas! 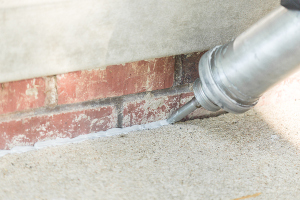 We’ll be happy to talk you through your options and help you decide if concrete joint sealant is the right solution for you. Flexible. Nexus Pro is able to accommodate concrete shrinking and expansion, which is common depending on the weather. Year-round installation. Nexus Pro can easily withstand extreme temperatures and therefore can be installed no matter the weather. Attractive. Because Nexus Pro is resistant to UV rays, it won’t bubble, dry, or crack and will leave your concrete slab looking its best. Fast cure time. Unlike urethane caulking products that can take anywhere from 24 to 72 hours to dry, Nexus Pro has a tack-free time of just 60 minutes. Durable. Nexus Pro is made to be a lasting solution for your concrete joint and crack sealing needs. Use with PolyLevel. Start with concrete leveling first if needed – Nexus Pro works in tandem with our PolyLevel concrete lifting services. In just a few easy steps, your concrete slabs will be ready for joint and crack sealing. First, your Peak Structural specialist will drill and smooth any cracks that need filling. Then, concrete joints will be prepped with backer rods. A backer rod prevents the sealant from sticking to the bottom of the joint, which would reduce flexibility. It also means that less Nexus Pro is needed per joint. After these two steps, your concrete is ready for Nexus Pro! We will install the sealant and remove any excess. And in just 60 minutes, the area will be ready for normal usage. Get started on concrete joint sealant today! In order to preserve the longevity and integrity of your property’s concrete slabs, consider sealing joints and cracks that can otherwise lead to lasting problems. Peak Structural has expert concrete technicians on staff ready to inspect and resolve your concrete sealant needs. Ready to begin your concrete project? Call Peak Structural at 1-719-260-7070 or contact us online to schedule your free estimate today! We serve customers in Colorado Springs, Denver, Pueblo, Castle Rock and nearby.